The typical striking sign to recognize these monkeys is their bright mask around their eyes, what made German speaking people call them „skull-monkeys“. Squirrel monkeys have a olive golden, black mottled back, belly, arms and legs are yellowy-orange. In opposite to other monkeys, they are not able to grab hold with their tail. Their top of their ears is pretty pointed. 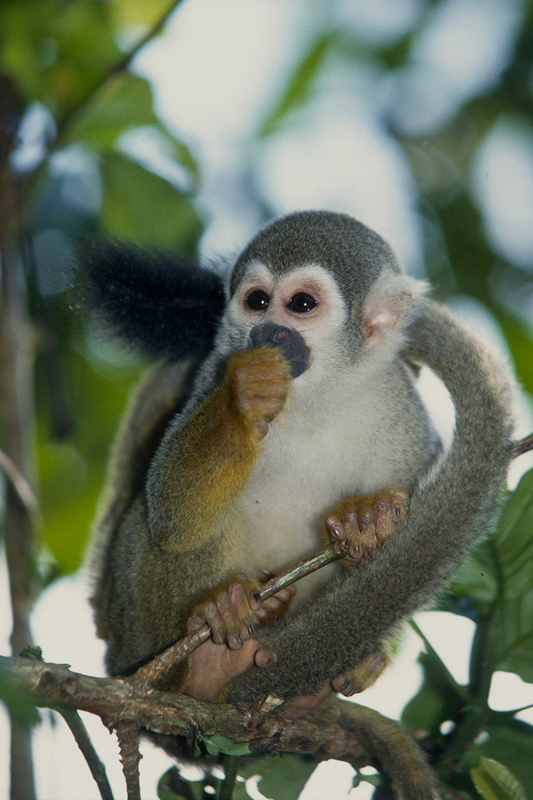 These monkeys are also diurnal and can be seen very often in the thick vegetation of the shore of the rivers and lakes where many lianas are growing. Often they are climbing to the top of the trees to get their food. They are living in groups of 20- 100 individuals. In Europe, the Squirrel Monkey „Mr. Nilsson“ had become famous through the children movie of „Pippi Longstockings“.